Taylor + Connor had the most amazing primary activity yesterday put together by our amazing primary leaders. (Thank you Lisa for all your hardwork! My kids are still talking about how much fun they had!) They dressed up in white shirt + tie, sunday dress + off they went to learn what being a missionary is all about. When they got home I thought they looked so cute I had to take this picture. At the same time it occurred to me that these two were born just 2 years + 2 weeks apart that means they will turn 21 + 19 the same month which means they could potentially leave on missions the same day! Not sure I could handle that, but it was fun to see their excitement of missionary work + learn more about what their Uncle Josh has been doing these last 6 months. Connor loved it so much he even wrote 2 pages in his weekend journal for school all about it. Oh SO cute. I miss those guys. Especially this wknd, wish you could have all been here. Can't wait to see Tay's hair, sure it is to die for...post pics soon. HELLO Jaim! Hey, I'll copy a CD for my mom! Thanx for the go ahead! *Can't wait to see the new "do"! 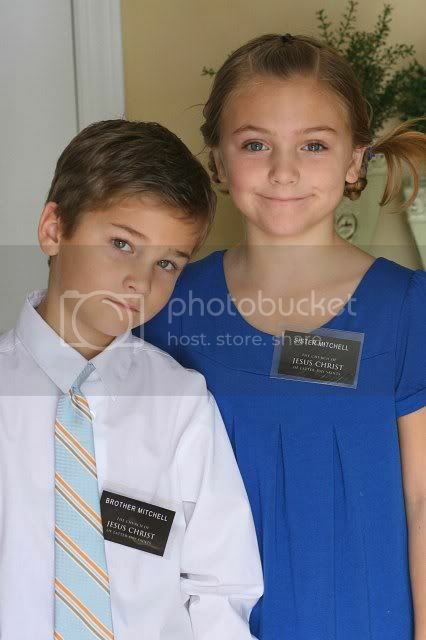 Such beautiful and handsome missionaries you have in your house. Hi Jamie. I don't remember how I found your blog (sometime last year), but have been a frequenter. I feel sill asking this but only you would know. My husband is currently interviewing for oral surgery residencies and the majority of them are back East. I am from Vegas and he is from SL, so we don't have much experience or knowledge of the East coast. I can't tell what area you are in but am assuming Buffalo/Rochester? He has interviewed at a hosp in the Bronx and has one in Rochester in 2 weeks and then another in Jersey. As far as raising kids (we will have 3) are there places to live in safe areas on a residents income? He has to rank the programs he interviews with (he has 9) and we are taking the living expenses into consideration. If you get a second, could you just let me know if any of these areas are familiar to you and what you have thought about moving so far away and the experience of being in a residency back East. Thank you so much, and I love your blog and all your cute ideas!